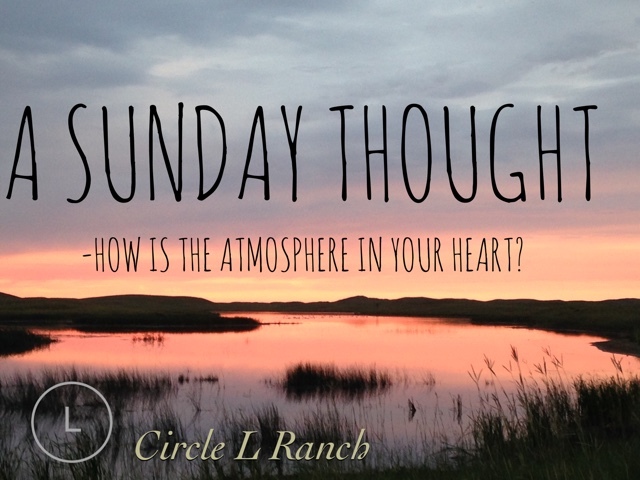 From The BlogA Sunday Thought The Blog A Sunday Thought How is the Atmosphere in Your Heart? Everyone of our hearts has an atmosphere. What is the atmosphere like in your heart? Do you feel like there is a lot of confusion? Do you feel like there is a decline in civility? Do see that some people like to display love, but there are some that like to display crass? What is the atmosphere of your heart? These questions have been on my heart the last couple of weeks. The atmosphere of our hearts depends on where and who we allow ourselves to be influenced by, and whatever is in our hearts. We can create an atmosphere of peace or hate. This atmosphere will be what flows in our hearts because it will conducive to what is in our hearts. You see, we are in our comfort zone when we create whatever is in our hearts and flow in it when it prevails. We can create and contribute to God’s kingdom, or we can create and contribute to the enemy. When love rules our hearts, there will be resistance when we try to walk in the atmosphere of evil. Our spirit of love will be discerned, but not welcome. To resist this atmosphere we must enter to feel a discomfort in our hearts. This feeling is out of our comfort zone. We must set up our atmosphere to see God’s light. Right? Satan is a very good recruiter. He makes us frustrated and then he wins by us thinking like him. I see it over and over and over. Do you? He figures that if he has a stronghold in our atmosphere, he can get us to do what ever he wants. I am out to shut him down and I want you to join me. How ’em I going to do that? Cut people some slack instead of cutting them clear off. Be humble and have compassion. Forgive and forget. Be thankful for everything that happens whether good or bad. Show gratitude by writing a note or maybe a phone call. Everyday give more complements than complaints. Give, give and give a little more!! No I am not talking about money. I am talking about time, energy and kindness. Not only will these things change our attitudes, but if we do these consistently, eventually the principle of sowing and reaping will catch up to us so our life will be full of people doing the same things. Thank you for reading. Hope you visit again.